Sky Tube is going to release the 1/6 scale Iris Hartley figure from the "Seikai no Lorelei", the original illustration series "TS Art Girls" made by Tony Taka. This figure is approximately 210mm in height and will be released in March 2014 around 10,800 yen. Wave Corporation is going to release the 1/10 scale Kotori Minami figure from the series Love Live! School Idol Project. This figure will be released under the Wave's Beach Queen series. This figure is approximately 165mm in height and will be released in December 2013 around 4,200 yen. Alter is going to release the 1/8 scale Aty figure from the series Summon Night. This figure is approximately 210mm in height and will be released in January 2014 around 11,000 yen. Square Enix is going to release the Play Arts Kai Joker action figure from the Batman series, "Arkham City". This figure is approximately 240mm in height and will be released in December 2013 around 8,800 yen. Square Enix is going to release the Play Arts Kai Batman - 1970's Batsuit Skin action figure from the Batman series, "Arkham City". This figure is approximately 280mm in height and will be released in December 2013 around 8,800 yen. Preview: Freeing's 1/8 Lisara Restall Dress Shirt ver. Freeing is going to release the 1/8 scale Lisara Restall Dress Shirt version figure from the series Dakara Boku ha, H ga Dekinai. This figure is approximately 200mm in height and will be released in March 2014 around 8,381 yen. Kotobukiya is going to release the 1/8 scale ARTFX Keigo Atobe figure from the anime remake The New Prince of Tennis. This figure is approximately 210mm in height and will be released in November 2013 around 6,800 yen. 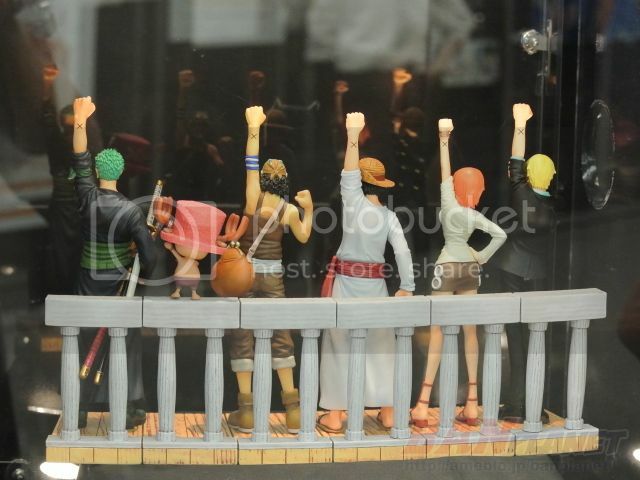 Here are the prototypes of the prize figure One Piece: Dramatic Showcase season 1 from the popular manga/anime One Piece manufactured by Banpresto as displayed at the 33rd Prize Fair Exhibition in Japan. 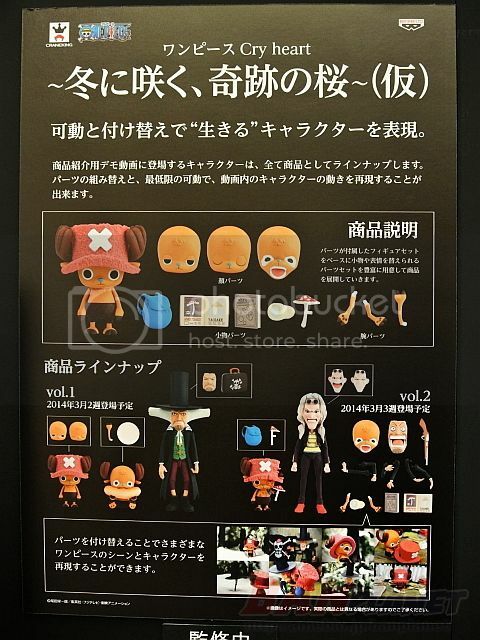 Here are the prototypes of the prize figure One Piece: Cry Heart from the popular manga/anime One Piece manufactured by Banpresto as displayed at the 33rd Prize Fair Exhibition in Japan. Arcadia is going to release the C:MO Asuka Langley Shikinami from the Neon Genesis Evangelion movie Evangelion 2.0 "You can (not) Advance". This figure is approximately 215mm in height and will be released in January 2014 around 8,800 yen.